Just a week into its release in PRC theaters, Lost in Hong Kong will easily surpass the 1 billion Chinese renminbi (US$160 million) mark. The sequel to the 2012 megahit Lost in Thailand now stands 7% ahead of the opening week pace of all-time box office champion Monster Hunt. It took the Xu Zheng directed comedy only 5 days to cruise past Mission Impossible – Rogue Nation, which is in its 23rd day of release in China, and to enter the ranks of the 8 highest grossing movies there this year. The film will meet little resistance in climbing past Jian Bing Man, Jurassic World and Avengers: Age of Ultron into the year’s top 3. 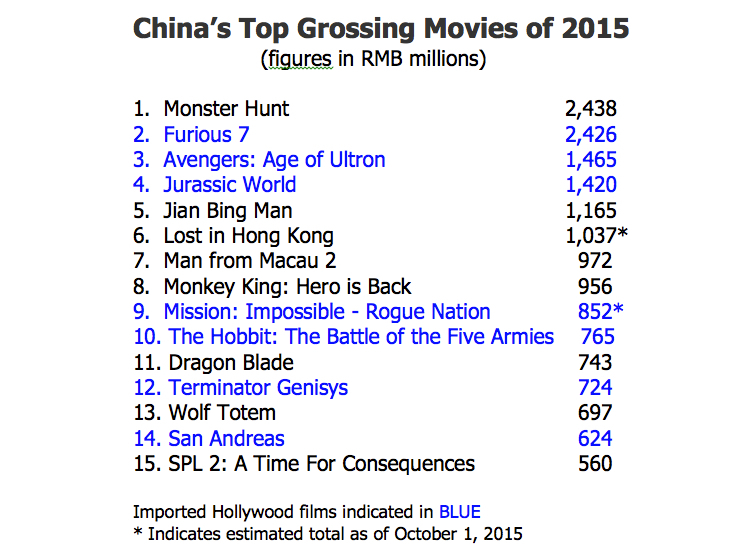 Whether it has the legs to catch up with Furious 7 and Monster Hunt, each at just over 2.4 billion RMB, remains to be seen. One factor that could slow Lost in Hong Kong down is that it faces a slew of competing releases this week as the National Day holiday week begins. One such competitor, Lu Chuan’s The Chronicles of the Ghostly Tribe, took first place on Wednesday with a solid $14.2 million opening day, compared to Lost in Hong Kong’s $13.7 million for the day. Among other releases that will attempt to cut down the Lost juggernaut are a pair of Disney imports: Pixar’s Inside Out, opening October 6th, and Marvel’s Ant Man, opening October 16th. Inside Out should open on about 15 to 20 percent of China’s movie screens, but its impact there will likely be limited, for two reasons. First, Pixar has struggled in China, with most of its films underperforming there relative to their success in the rest of the world. Second, a pirated HD version of the film is already widely available, which will unfortunately allow many families with kids to view it at home rather than at the multiplex. Such are the hazards of China, where releases like Inside Out can be delayed for 6 months or more. Of course, Monster Hunt also scored its 2.44 billion RMB ($392 million) record gross despite hefty completion from Jian Bing Man and Monkey King: Hero is Back. All three films played in China’s multiplexes at the same time in August, yet they managed to notch the number 1, number 5 and number 7 rankings among all films for the year so far. 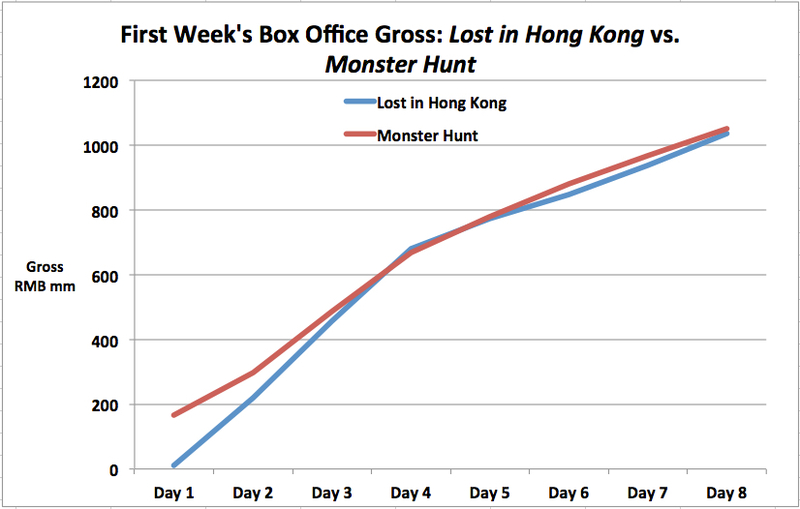 Whatever its final tally, Lost in Hong Kong will put China that much closer to achieving a $7 billion aggregate box office gross by year’s end, a remarkable achievement for a territory that was worth only $1.5 billion in annual box office in 2010.